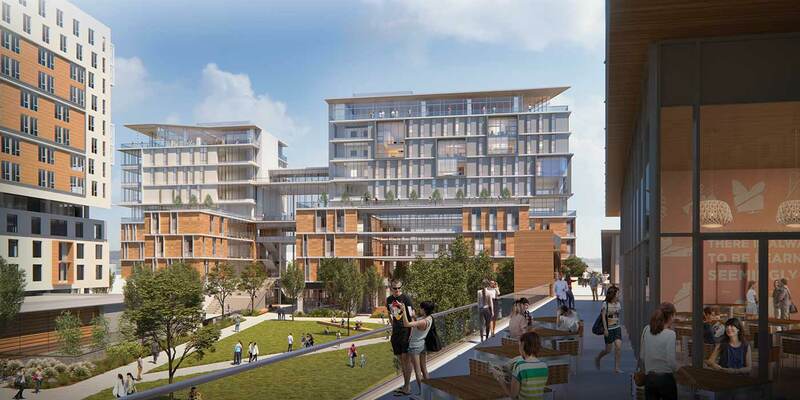 When the North Torrey Pines Living and Learning Neighborhood breaks ground on June 18, a neighborhood like no other at UC San Diego will begin to take shape. Located between Muir and Marshall Colleges on the west campus, the new neighborhood will be a vibrant, mixed-use community incorporating residential, academic and administrative space, retail and parking. With a footprint covering more than 10 acres, the 1.6 million-gross-square-foot project is the largest in the history of the architecturally acclaimed campus. The complex—expected to be completed in fall 2020—will become the new home for Sixth College, comprising 2,000 undergraduate beds, 1,200 underground parking spaces and a market, dining hall, retail space and craft center. The neighborhood will also house two new academic buildings—one for Social Sciences and one for the Arts and Humanities. Known as the Public Engagement Building, Social Sciences’ space will be anchored by the Department of Education Studies; CREATE, the Center for Research on Educational Equity, Assessment and Teaching Excellence; and the Urban Studies and Planning Program with its new Real Estate and Development program major. For Arts and Humanities, the division’s new building will mark the first time in the university’s history that all three humanities departments—History, Literature and Philosophy–will be gathered in the same space. 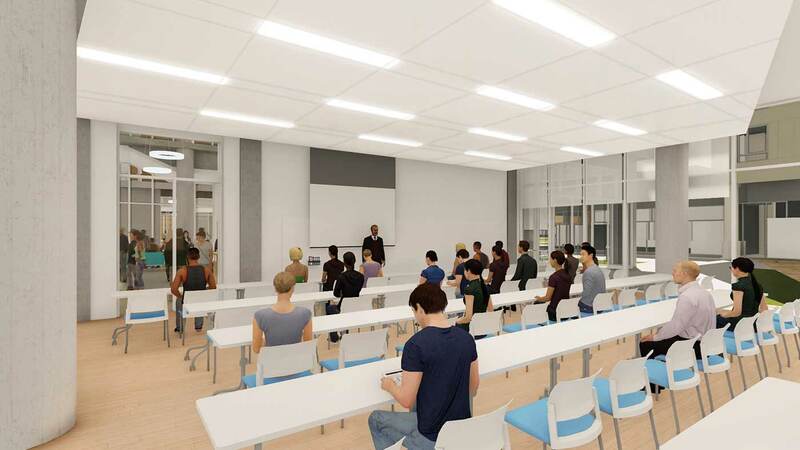 Included in the academic space will be eight general assignment classrooms and four active learning classrooms, which are student-centered, technology-rich spaces, designed to facilitate student interaction. There will also be four lecture halls of varying sizes–two 250-seat halls, one 350-seat hall and a large-scale 600-seat lecture hall. In addition to providing much-needed living and academic space, the North Torrey Pines Learning and Living Neighborhood will also provide thoughtfully designed open space and public realm improvements including the realignment of Scholars Drive. Construction of the North Torrey Pines Neighborhood will also strive to meet campus sustainability goals with the project seeking to achieve a Leadership in Energy and Efficient Design (LEED) platinum rating. Landscape design will be consistent with sustainability goals as well, emphasizing drought tolerance. The neighborhood also presents an opportunity for improved landscaping and signage at UC San Diego’s Muir College Drive entrance that will contribute to a sense of place, making wayfinding easier and reflecting the unique character of the university. “The North Torrey Pines Living and Learning Neighborhood presents the university with so many opportunities to transform this area of campus,” said Smith. However, new opportunities often bring new challenges. While the neighborhood will add much-needed housing and learning space as well as a large underground parking structure, it will be built on two large surface parking lots, P207 and P208, which currently provide 970 spaces for the west campus. A new parking structure–the Osler garage near the School of Medicine –will open this summer, providing 1,350 spaces and helping to alleviate some of the issues. 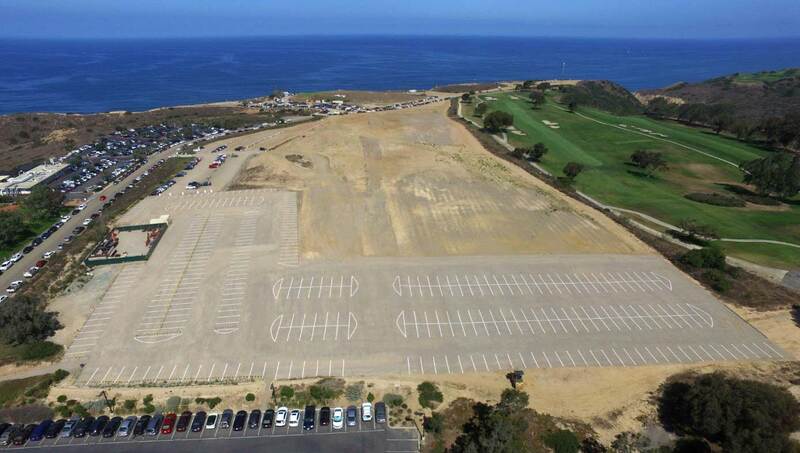 A new shuttle will also serve the Torrey Pines Gliderport Lot. The lot already has space available all day and will have 100 spaces added this summer. Spaces will also be re-configured to reduce the walking distance to campus or the shuttle. Piloting a new valet lot near the North Torrey Pines Neighborhood site during summer quarter 2018 with possible continuation for fall. Lyft rideshare and Spin bikes remain available for the campus community to use and Transportation Services is also offering a complimentary ECO Pass trial for new faculty and staff transit riders during Summer Quarter 2018. The campus community is also encouraged to engage with Transportation Services through one of their new outreach vehicles. Sign up for First to Know to receive timely notifications about changes to relevant parking and shuttles or participate in a Virtual Town Hall to provide feedback on proposed changes to parking. This article was originally published on This Week@ UC San Diego. Posted in Pride, Spark, The Future and tagged #future, #growth, #LivingandLearning. Bookmark the permalink.